Hello friends! As you know, salmon is one of my favorite things to eat. It’s healthy, fast, and also very easy to cook if you know a couple winning recipes. My usual go-tos are my dill-roasted salmon, lemon salmon, or a simple spice-rubbed salmon. But sometimes, you want something different. In researching recipes, many are fairly complex. You have to make a sauce that you cook in a sauté pan or chop a bunch of ingredients up. 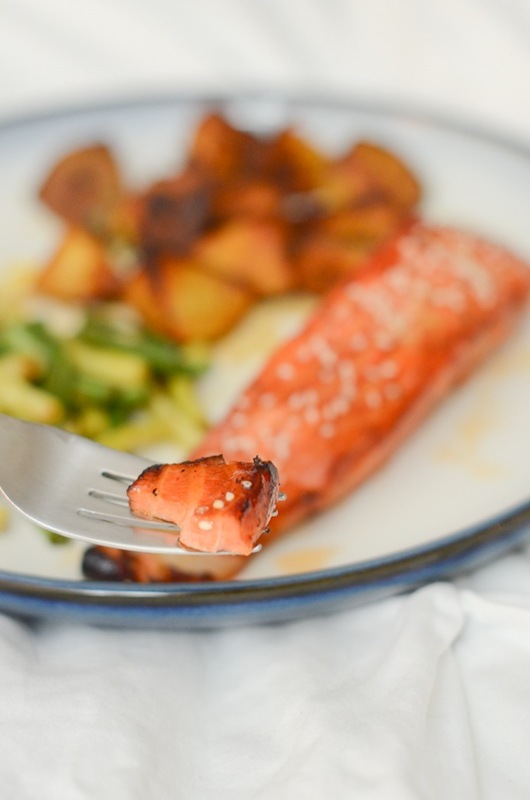 And while those recipes have a time and place for me, I often turn to salmon for my weeknight meals because of how quickly I can put a meal together with it. So, here’s a recipe that is fairly quick for a marinade-based recipe. 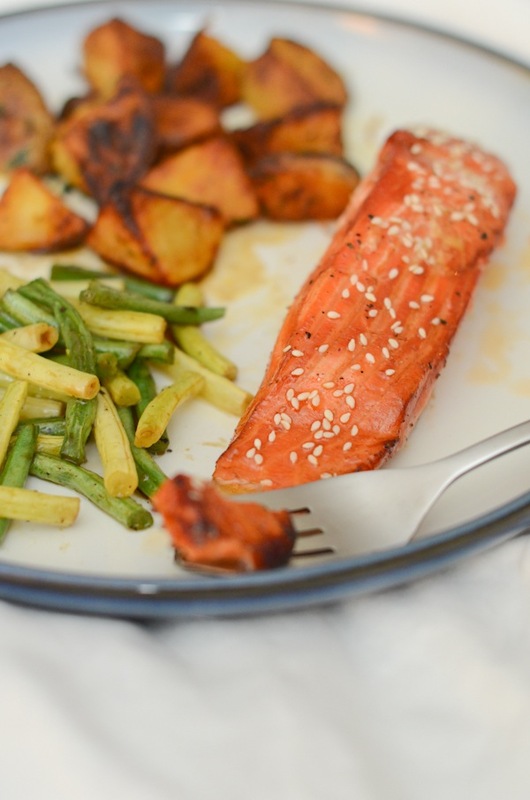 It’s my Tamari Honey Salmon Recipe with a quick and healthy marinade. You can make it in just a couple short minutes. It’s so fast to put all the ingredients together. You only need to marinade the salmon for about 30 minutes, though you could probably go even shorter if you were in a mega-rush. On top of this, if you’re wanting to save on dishes, you can put this marinade straight into a plastic bag and mix it up there. And I find this recipe works great for nights when I go to the store before my workout. I’ll grab the ingredients, prep this in about 5 minutes or less, and it will be marinating away while I’m working out, taking care of errands, etc. Additionally, baking the salmon frees you up from constantly flipping, stirring, etc. You can prep your sides while the salmon cooks. Marinade Tip: When marinating the salmon, I like to keep mine skin side up so the marinade really gets into the top of the salmon. After that, it’s as simple as putting the salmon on a baking sheet and baking away. You’ll be rewarded with this delicious salmon for dinner. Yum! Tamari -> Soy sauce will give you a similar flavor. Honey -> Agave or maple syrup would work if you don’t like honey. Sesame seeds -> Toasted or black sesame seeds would work too. I’d be curious if anyone tried this with a different fish. Let me know how it works out. It’s taken me years to get into seafood, so I stick to what I know more often than not. 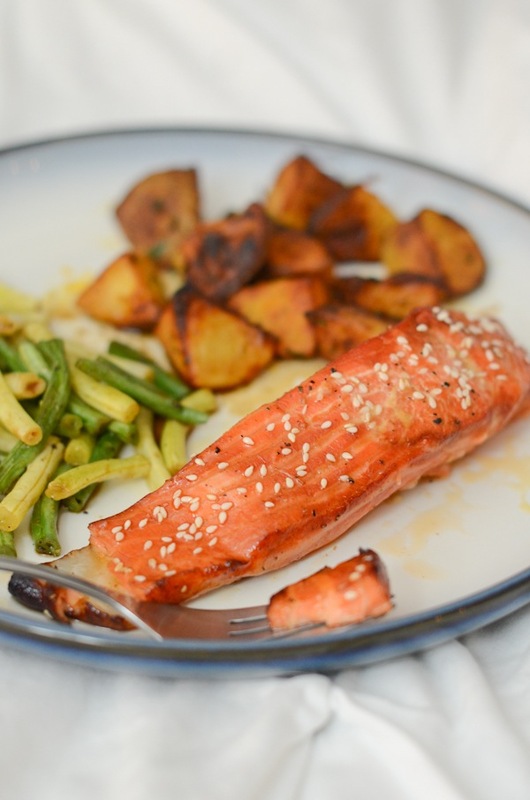 This quick Tamari Honey Salmon recipe comes together in a matter of minutes. Marinate it away while you workout or take care of errands. Bon appetit! In a bowl, combine tamari, rice vinegar, honey, sesame oil, garlic powder, and black pepper. Whisk together until well combined. Pour into a plastic bag and add your salmon. Close the bag and massage marinade over salmon until it’s evenly coated. Marinate salmon in the refrigerator for at least 30-40 minutes. Pre-heat oven to 375 degrees F. Prepare a baking sheet with parchment paper. 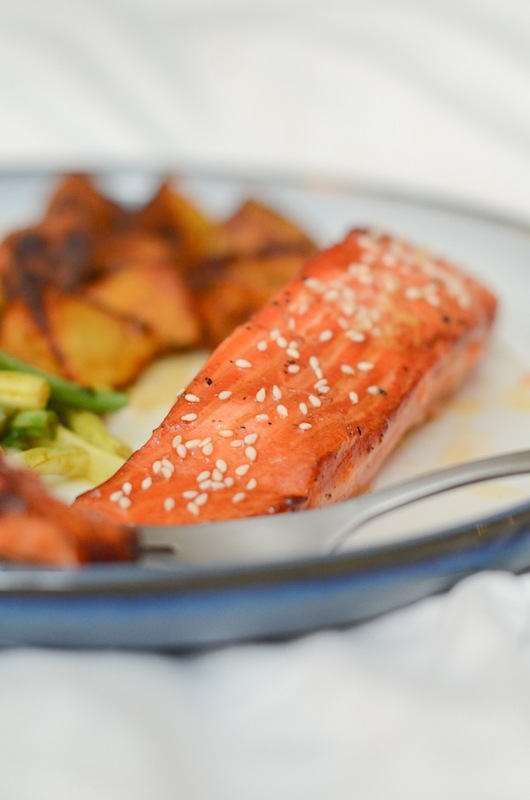 Remove salmon from marinade and place onto prepared baking sheet. Bake until cooked to your liking. I usually bake mine for about 10 minutes per inch of thickness of the filet. Serve and enjoy! I like mine with brown rice and steamed broccoli.